Today I have another scrap page to share with you. This time it is for a challenge in Facebook group - Scrap It With Attitude. The challenge was a nature inspired one. Here is my interpretation. The photo I took at a local regional park - Fagan Park. It has the most glorious garden displays. I could spend days out there just admiring all the lovely gardens and beautiful flowers. You may notice the paper I have used is from the Bohemian Designer Series Paper pack. But mine looks a lot less dark. That is because I have used the super cool whitewash technique on it that Bonnie Thurley showed us at the Inspire Create Share event earlier in the year. I have a feeling that this technique will be used quite a lot in the future. 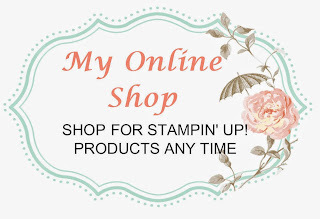 I have many many non Stampin' Up! papers in my scrapping stash that I keep going past because they are a bit bright and or bold for my liking. But now I have a wonderfully easy technique to change them and therefore use them. These wisteria wonder flowers on this layout have been made by scrunching up wet round disks of card stock that have been held together with a brad in the middle. Then they are dried with the heat tool and they miraculously keep there shape. So easy to make. I hope you like this layout. As always, if you need any supplies at all, please visit my online shop. If you do, then you will go into the draw to win a wonderful prize pack. If you don't know how to apply the Hostess Code, then see the instructions below. And if you have ever thought about joining Stampin' Up! then I have great news for you. If you join between June 2 and June 30, you will get an extra TWO sets of stamp sets FREE. That is in addition to what you already get to choose for your Starter Pack. Great deal huh ! If you need any information on what is involved in joining or any of the wonderful benefits of being a member of my stamping family, then just be sure to drop me a line.